Secret Canyon lies within the most popular area for hiking around Sedona, the Red Rock Secret Mountain Wilderness, centered around Dry Creek a few miles northwest of town. 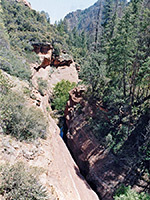 This is a wide valley surrounded on three sides by high red cliffs split by many deep, hidden canyons, usually with a maintained footpath at least part of the way upstream. Important trails include those up Boynton Canyon, Long Canyon, Sterling Canyon (Vultee Arch Trail) and Secret Canyon - the longest in the area at 4.4 miles, one way, though the end point is not clearly defined and a faint path extends several miles further. This canyon is similar to the West Fork of Oak Creek as it is quite steep, densely wooded and contains a permanent stream with pools and waterfalls, though is much less traveled so offers more tranquility. It has some confined passageways but no extended narrow sections. Secret Canyon topographic map, Sedona location map. 8 views of Secret Canyon. From US 89 in Sedona, Dry Creek Road (FR 152) leads north for 1.5 miles then continues as an unpaved track branching off to the northeast. The Secret Canyon trailhead is 3.4 miles further along a rather bumpy and rutted track, which for the last few years requires a 4WD vehicle to negotiate. The path follows Dry Creek, crossing the streambed twice but mostly passing a short distance above it on the east side. This part of the valley is still very wide, and the vegetation is a mixture of grasses, cacti, ocotillo and bushes, including large areas of colorful manzanita, and allows for sweeping views of the layered red and white rocks that rise over 1,000 feet at either side. The start of another trail to H S Canyon is reached after 0.6 miles, then after climbing rather higher above Dry Creek for a while, the main path drops down, crosses a tributary and turns due west, entering the mouth of Secret Canyon about 2 miles from the trailhead. Walking upstream, the walls close in and quite soon the scenery becomes little changing - a deep gorge, quite overgrown by fir trees and bushes that grow on the valley sides, in crevices in the cliffs above and even in the streambed. The tall trees tend to obscure views of the cliffs which are now more sheer, made of red Supai sandstone lower down and gray Coconino sandstone higher up. The path is level initially then more undulating further into the canyon, where many steep, short ascents and descents bypass narrow, boulder-filled channels that may also have pools, since a stream is usually flowing in this section. The route involves frequent crossings of the creek, which is filled with stones and boulders and with occasional nice watery narrow passages though often these are out of sight as the path is quite high above, running through flatter, wooded land at either side. The valley harbors a few deep pools and waterfalls, increasing in frequency further into the canyon as the gradient increases. The path gradually peters out as the ravine narrows, a point which takes 2 to 3 hours to reach, but this need not be the end of the hike, as by walking in the stream bed and sometimes scrambling over small dryfalls, it is possible to continue the whole length of the canyon, and meet up with other trails in the Coconino National Forest.